The robotic lawn mower is suitable for the use in gardens of up to 1,000 m2 and gradients of up to ±30 % (about 17°). There are three sharp rotating blades on the bottom of the device. Thus, it cuts the grass reliably even when it rains. A "smart Gateway"
The Gardena smart Sileno life 1000 is ideal for use on larger lawns up to approx. 1,000 m2 and for slopes of up to ±30 % or approx. 17 °. An easy-care lithium-ion battery provides enough power. The robot is much quieter during work than a conventional lawn mower and therefore can be optimally used at night. With the aid of the so-called "smart Gateway" (included), the robotic lawn mower can also be programmed and controlled via app for tablet or smartphone, as well as via the PC. The Gardena smart Sileno life 1000 can be extended and combined with all Gardena smart System products. This is how the smart garden becomes reality! The Gardena smart App is available as a free download for iOS (App Store) and Android(Google Play). With the remote start function, up to three variable starting points for the robot mower can be defined. The robotic lawn mower reliably mows even isolated areas of your garden. Hard-to-reach zones, which are connected to the main surface only through narrow passages, are optimally manicured. This guarantees a uniform cut. To ensure that the lawn robot reliably finds its way to the ancillary areas, it is equipped with the so-called "EasyPassage" function. It recognizes bottlenecks and adapts its navigation style accordingly. The robot lawn mower skillfully navigates through them and leaves no traces. 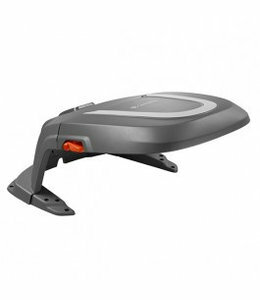 The so-called "SensorControl" function enables the robotic lawn mower to automatically adapt its mowing frequency to the grass growth. During periods of drought, it reduces the mowing frequency so that the short grass does not dry out. During rainy periods the robot lawn mower increases the mowing frequency again. Your lawn receives an optimal care, according to the weather conditions. A mowing plan can be created for the robotic lawn mower on the LCD display or via the app. The robot mower mows fully automatically only during the defined mowing hours, even if it rains. When the battery level is low or when a mowing cycle is complete, the robot automatically returns to the charging station. The lawn robot does not navigate systematically but randomly. With regular use, it reaches every point of the mowing area. Three sharp, rotating blades cut the grass. The cutting height of the Gardena smart Sileno life 1000 can be adjusted between 20 and 50 mm. While mowing, fine mulch is created, which falls down to the ground. There, the grass remains are decomposed over time and serve the soil as a moisture and nutrient donor. This leads to a significantly improved lawn quality. The Gardena smart Sileno life 1000 is equipped with various safety sensors (collision, lifting and tilt sensors). When the robot lawn mower encounters an obstacle, it changes its direction of travel. If the device is lifted or tipped over, the rotating blades stop immediately. A PIN codeserves as a child safety lock and protects against theft. The installation of the robot lawn mower is easy and can be done in just a few steps. All accessory parts required for installation are included in the scope of delivery: Buondary wire, cable pegs, cable connectors, and detailed operating instructions. The Gardena smart Sileno life 1000 weighs only 8 kg. This makes the lawn robot easy to handle. Unlike most robot lawn mower models, according to the manufacturer this model can also be cleaned under running water (for example with the garden hose). This makes the maintenance particularly easy and quick.